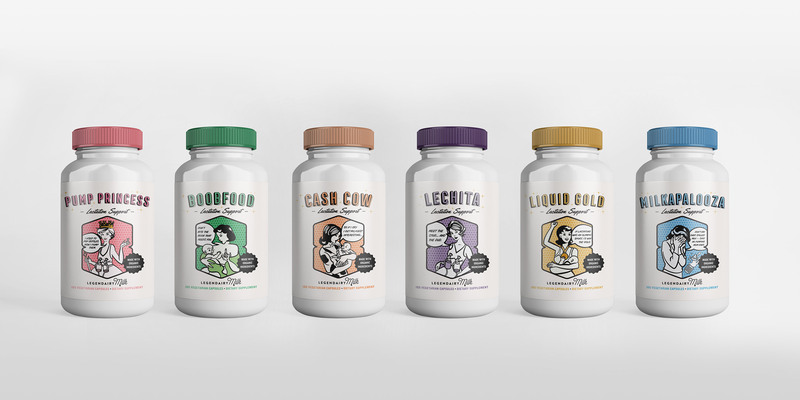 Legendairy Milk is an Austin-based organic supplement company that helps nursing mothers boost breast milk production. With concern about an inadequate milk supply being the #1 reason women stop breastfeeding, founder Luna Feehan sought to provide support-through herbal lactation supplements and holistic resources. Through an honest, raw, and informative approach to help breastfeeding mama’s on their journeys’, the company experienced rapid growth. Legendairy Milk sought out MODintelechy's help to aesthetically elevate their brand to reflect the quality of their products. MODintelechy was asked to concept and develop identity and package designs for each of Legendairy Milk’s unique products, aimed at health-conscious nursing and expectant mothers. The challenge was figuring out how to visually convey a modern representation of what nursing mothers go through - exposing the greenness of it all with a humorous twist. Inspiration was taken from retro advertisements to juxtapose empowering personas for each product in the line. The goal with the illustrations was to help women not feel alone or embarrassed about these issues through an affable, approachable and comical design. "MODintelechy used a unique blend of vintage and cheeky illustrations to communicate the brand’s warm and mommy-minded vision." With a brand identity reflecting empowering, yet authentic breastfeeding themes with a playful spin, Legendairy Milk was able to further increase their sales volume; transitioning their small-scale Etsy shop to a widely-trafficked and sought after e-commerce site. MODintelechy won a Graphic Design USA Packaging award for the work. Legendairy Milk continues to expand and gain brand awareness, most recently surpassing 20,000 followers on Instagram, and adding two new supplements to their product line.